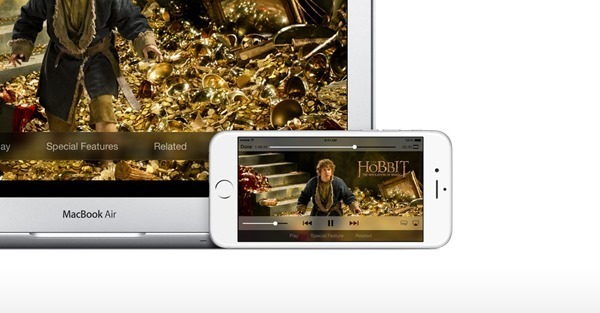 We already knew that the iPhone 6 and iPhone 6 Plus packed quite the computational punch, but new testing by the developers of Mac app WALTR has found that both devices are actually capable of playing 4K video. For those not familiar with the app, WALTR is a Mac utility that makes it possible to transfer and play back any video or audio file to an iOS device, including file types that are not normally supported by iOS such as the always popular MKV file format commonly used for storing high definition video. During a YouTube video, the app’s developers have shown an iPhone 6 running two types of video with a resolution of 3840 x 2160 – one a 50Mbps stream and the other a 100Mbps offering. When playing the 50Mbps stream the iPhone performs admirably, playing the video back with no issues whatsoever, fluid scrubbing through the content using the built-in controls. When tested with the 100Mbps stream, things start to get a little hairy though, with scenes containing more activity causing slight graphical stuttering here and there which, let’s be honest, is pretty understandable. The iPhone 6 and iPhone 6 Plus’s ability to play back any 4K content at all is impressive and can be attributed to the A8 chip that beats at the heart of both of Apple’s latest handsets. While neither phone has a screen with a resolution high enough to take advantage of the ability to play 4K video, the fact the hardware is currently capable of it bodes well for future iPhones and anyone with 4K video right now will be able to watch it without issues dependent on the way it was encoded. Given the huge file sizes at play here though, we doubt too many people will be using them on their iPhones just yet anyway. It would be nice for Apple to throw in 4K video support into the mix at some point in a future iPhone model, but going by how Apple works, we doubt that would happen any time soon. At least not until that magnificent Retina display on the iPhone gets a huge leap in the first place. But still, what’s wrong with having support for 4K, Right? By doing ­this ­on­lin­e job you can fulfill your dreams. Imag­ine, you have mor­­e ti­me for your frie­nds and fam­ily, for your h­obbies a­nd­ trave­ls. The on­ly t­­hing yo­u need is a co­mputer ­and an internet connection. By doing t­his job you are no­t tied to the house or any place, and the money is co­ming. This is not a ­spam or a scam and you can be sure of th­at­ by followin­g this link. The 4s doesn’t have a 1080p screen either, yet it record and plays back 1080p. So what’s your point? I do, being that APPLE is suppose to lead the industry with these things. Not wait 2yrs after and call it IHD retina or some bs. Step your game up Apple!! 4K in a 5″ screen is ridiculous because you can’t tell the difference. The only time you can tell the difference between 1080p and 4K is when you get above a 40″ screen. It is ridiculous regardless of which company doing it. Sacrificing battery life on something that already have short battery life. It’s downscaled. You know how downscaling works on graphics card to make it seem at lot better than those fancy AA and filtering settings? Apple rubbed it in your face. Thanks for the article Oliver. Netflix app (or Hulu, or BBC, etc) is great on iPhone. If live outside USA, you can use tools like UnoTelly to get Netflix (or Hulu, or BBC, etc) on your iPhone.